— and were met with overwhelming enthusiasm. Now, Google Fiber is live in Kansas City, Provo and Austin, and we've started to see how gigabit Internet, with speeds up to 100 times faster than today’s basic broadband, can transform cities. It can give them new platforms for economic development and new ways of using technology to improve life for their citizens. And, around the country, it seems to be catching on. Check out the Kansas City Startup Village and Provo learn-how-to-code hub DevMountain. Take a look at the work of a geneticist whose speedy connection could one day help newborns in intensive care, or how one city's network is connecting a high school classroom to an underwater microscope so students can study oceanic life in the Pacific... from Chattanooga, Tenn. There are many more stories like this—stories about how people are using gigabit internet to spark innovation, inspire creativity, and collaborate in ways they simply couldn't before. And we want to see even more. So, today, we’re happy to announce that Google Fiber is coming to 18 cities across four new metro areas: Atlanta, Charlotte, Nashville, and Raleigh-Durham. We can’t wait to see what people and businesses across the Southeast U.S. do with gigabit speeds. 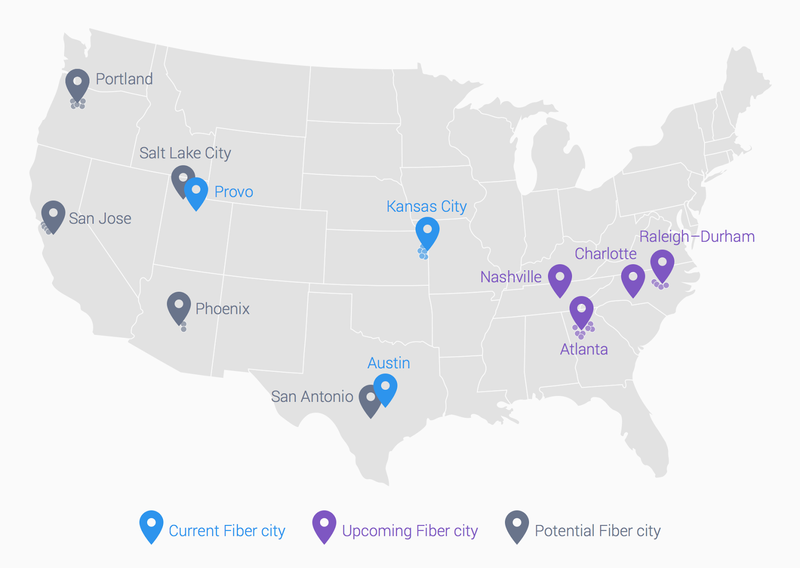 Bringing Google Fiber to these cities is a long-term investment. We’ve been working closely with city leaders over the past year on a joint planning process to get their communities ready for Google Fiber—and now the really hard work begins. Our next step is to work with cities to create a detailed map of where we can put our thousands of miles of fiber, using existing infrastructure such as utility poles and underground conduit, and making sure to avoid things like gas and water lines. Then a team of surveyors and engineers will hit the streets to fill in missing details. Once we’re done designing the network (which we expect to wrap up in a few months), we’ll start construction. We’re also continuing to explore bringing fiber to five additional metro areas—Phoenix, Portland, Salt Lake City, San Antonio and San Jose, and will have updates on these potential Fiber cities later this year. Today, we aren't the only ones talking about gigabit broadband. From the White House to main street, a chorus of new voices is standing up for speed. Just last week during the State of the Union, the President called for faster networks so that innovators and entrepreneurs can build the next big idea. New research from the Fiber to the Home Council shows gigabit networks are contributing billions of dollars in economic growth. Communities across America are demanding more speed for their own homes and businesses, and we’re going to keep doing our part to help. It’s been nearly five years since we offered to build a fiber-optic network in one U.S. city as an experiment — and were met with overwhelming enthusiasm. Now, Google Fiber is live in Kansas City, Provo and Austin, and we've started to see how gigabit Internet, with speeds up to 100 times faster than today’s basic broadband, can transform cities. It can give them new platforms for economic development and new ways of using technology to improve life for their citizens. And, around the country, it seems to be catching on.